The smell of the Italian food being cooked was too much to resist. The El Galeon is a Cabo San Lucas Italian restaurant we spotted while on the Marina. So we went inside got a table by the window, overlooking the Marina, and scanned the menu. The Calamari Fritta which is fried Calamari sounded like the tastiest starter so that got ordered first. The Cocktail di Gamberi which is a Shrimp cocktail was also ordered, and both passed the taste test which which was good. That set us up for the next dish. We was feeling a bit hungry at the time so we ordered a salad before the main course. We could have ordered the Caesar Salad that was for two people but we wanted something a bit different each, plus that way you get to try out two different dishes. So we went for the Sorrento, which was tomato, garlic, basil and olive oil. Being a garlic lover it was gorgeous. Our second salad that was ordered was an Insalata Mista, which was basically a mixed salad. So the two of them went quite well with each other. This was of course all being washed down with a nice bottle of Italian red wine. It was helping with the winding down of an adventurous day in Cabo San Lucas. And the El Galeon was giving the day a perfect end. This Cabo San Lucas restaurant hadn't let us down so far, and next was the main course. They did a few veal dishes which we gave a miss but seeing as we was next to the Marina we knew the fish would be fresh so we had to go for the Gamberoni Provenzale which was a shrimp dish with garlic, herbs and wine. We was drinking enough wine already but I wasn't complaining. We also ordered a pasta dish to go with it that was called Fettuccine Alla Luciana which again was shrimp with black olives and tomato sauce. They had beef and bacon pastas but we stuck with the fish as it went better with the Gamberoni Provenzale, and we don't eat fish that often. 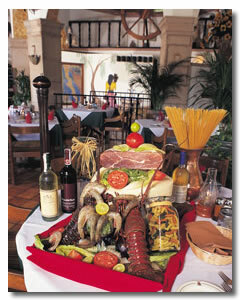 The main course topped off what was an excellent Italian meal at an excellent Cabo San Lucas Italian restaurant. If you want to make a reservation at the El Galeon you can phone them with this number (624) 143-0443. 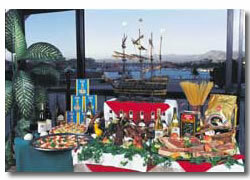 If you like Italian cuisine, and your in the area of the Marina the El Galeon is recommended.